Steve G. Jones, Ed.D., Clinical Hypnotherapist, charges $1,500 for a custom recording and $25,000 for a one-hour private hypnotherapy session at his office. But you can get all the benefits for this low price. Simply listen to the Fear of Horses Hypnosis MP3 every night as you go to bed for three weeks and feel the changes happening in your life. You will feel more empowered, more in touch with your true self, and you will truly know that your goals are within your reach. Steve G. Jones achieves AMAZING and LASTING results!!! Hypnosis is the easiest way to affect change in your life because the positive messages go straight to your subconscious mind effortlessly so you can accomplish your goals and reach for the stars!! All you have to do is listen to the Fear of Horses Hypnosis MP3 download at night as you go to sleep!!! You’ll hear soft music, the gentle sounds of the beach, and the soothing sound of Steve G. Jones’ voice all working together to bring about positive changes in your life easily and naturally. Steve G. Jones has been helping people improve their lives with hypnosis for over 17 years…now it’s time for him to help YOU… don’t wait, do it NOW !!! you’ll be glad you did. See you at the top! You are feeling very comfortable and you are completely at ease. Now, picture yourself entering a movie theater. Take a look around. It is a very large and open room. The theater has many rows of red comfortable seats. The movie has not yet started, so it isn’t very dark yet. You look at the movie screen. It’s large and you look forward to watching the movie. You look up and toward the back of the theater and you notice a small window. This is the projection room, where they project the movie onto the screen. You sit down in the front row and get comfortable. Perhaps you are with a friend or maybe you are by yourself, it is up to you. The chair is large and you feel safe in this movie theater. Trailers to upcoming movies begin and you get absorbed in them. Now it is time for the movie to start. You are feeling completely at ease and you are excited about the movie starting. So, you sit back and enjoy. As the movie begins, you notice that you are in this movie. That’s right, you are the star of this movie. You watch yourself on the big screen and you are happy to see yourself. In the movie, you are in a grassy area walking toward a fence and closer to the horse. You are walking towards a fence that holds a horse. You watch as you get closer to the fence and closer to the horse. Now if at any point you feel uncomfortable, you are able to transport yourself into the projection room and watch from afar. Also, if you have any difficulty with watching the movie, you can shut it off at anytime. Let’s pretend that you are feeling a little uncomfortable, so you go into the projection room. You are a little more at ease up here because you know you have a little more control. You watch yourself from high up in the projection room. In the movie, you are at the fence, about 25 feet from the horse which is approximately 8 meters. The horse does not notice you. It stands there, only caring about the hay it is eating. You start to feel a little more comfortable in the projection room. You are not tempted to shut down the movie, but you know you can if you need to. You watch yourself in the movie, you reach your hand out, as if to say hi to the horse, and the horse continues to eat. You are feeling a little more comfortable now, so you decide to go back into the theater and watch from the front row. You settle down into your comfortable seat. You understand that if you feel fearful at any point in time, you can go back to the projection room and turn off the movie if you have to. You continue to watch and you find yourself enjoying the movie. In the movie, you take a large carrot out of your pocket and hold it out to the horse. At first, the horse doesn’t notice you holding out the carrot, but he eventually turns his head and looks interested in what you have to offer. The horse starts to slowly approach you in the movie. You calm any fear that comes to the surface. Because you understand that you can watch this horse and feel confident that it will not harm you, because you are only watching. The horse comes up to you in the movie and lightly takes the carrot out of your grasp and begins to eat it. If at any time, you are feeling comfortable with the movie, go ahead and put yourself in the movie. Pretend that you are next to the horse. If you feel uncomfortable, that is fine too and you can stay in the theater or in the projection room. As you continue to look up at the screen, the horse pauses for a little while and seems to be waiting to see if you have any more carrots; this makes you happy and you smile. This is the point in time, maybe not now, but maybe in future listening of this recording, you decide to be in the movie. Let’s pretend that you are now in the movie and you are leaning against the fence with another carrot in your hand. The horse is about 4 feet from you. If you feel uneasy, you can go back to the theater or the projection room, but right now you feel confident. You trust the horse to be nice to you. He takes a couple steps toward you and eats the carrot from your hand. You feel like you have accomplished great things and you have. You now realize that you can feel at ease around horses. You are confident and strong and you are ready to take on whatever comes your way. And each time you listen to this recording you become more comfortable around horses. Very soon indeed, in your everyday life you will be able to approach horses easily in a very calm and peaceful and happy way. So relax and realize that everything is going to be just fine. If you are scared of horses, realize that there is no need to fear horses. You can easily conquer your fear of horses by using hypnotherapy. 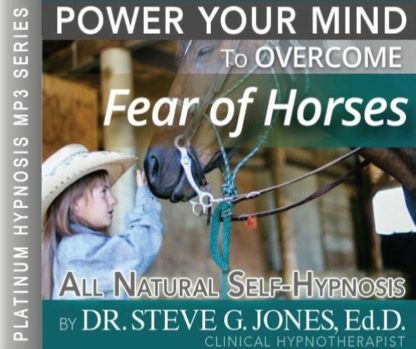 In the Overcome fear of Horses self-hypnosis program by Steve G. Jones, he uses the same techniques he would use in a personal session. Your fear of horses is rooted in your subconscious mind. This Fear of Horses Hypnosis MP3 audio works by re-programming your subconscious mind and replacing negative thoughts with positive thoughts in relation to horses. Whether you have previously been on horses or not or if you have had a bad experience with them or not, hypnosis is a safe and natural way for you to deal with your fear of horses. You will learn to feel safe, calm, and relaxed around horses by using Steve G. Jones’ powerful techniques on this Fear of Horses Hypnosis MP3 recording. You will be told to visualize yourself near horses and you will be told that you are calm and at ease. These positive suggestions will change your fears into positive thoughts. We suggest that you listen to this hypnosis recording for 21 nights in a row before going to bed. Relax and let the powerful suggestions reprogram your subconscious mind so that you will no longer be fearful of horses.